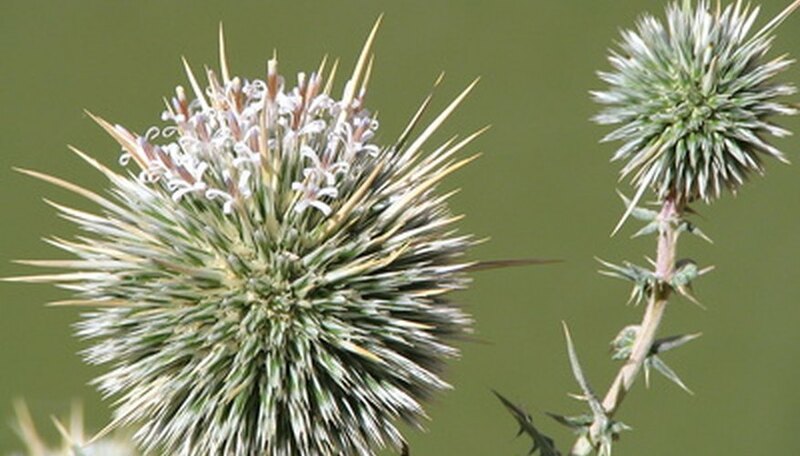 Different types of thistle such as bull thistle, Canada thistle, yellow star thistle, musk thistle and Italian thistle are collectively called ‘star thistle’. These fast-growing, noxious pests are found in many lawns and gardens all over the United States, spreading quickly to cover an entire area with their thick growth. They are detrimental to other plants, as they compete for nutrients in the soil, and grow in almost any type of soil. Persistence is required to eradicate them from a back yard, orchard, pasture or rangeland. Wear gloves to manually remove thistle growing in small patches or spots by pulling it off or digging it from the ground. Make sure you pull the entire root system, including the taproot, since thistle spreads by seeds or roots. Collect the thistle in a large plastic bag, knot it tightly and discard appropriately. Aerate the soil with an aerator or shovel to loosen compacted soil. This ensures the herbicide or weed killer reaches deep down to prevent future growth. Pour herbicide that contains glyphosate, or any weed-killer specifically formulated to kill the particular thistle type, over the aerated area. Follow label instructions when pouring. Use a spray bottle to spray herbicide directly over the star thistle if there is other foliage nearby, to prevent damaging them. Grow competitive plants such as rose or crimson clover in large areas to prevent star thistle from growing there. Release certain insects that are natural enemies of the star thistle in the area–they will attack the flower heads and reduce seed production. Different insects target different types of thistle plants, so make sure you know the specific type you want to eradicate from your lawn. For instance, the thistle-stem gallfly chews on the stem of Canadian thistle and peacock fly kills yellow star thistle. The thistle head weevil eats several species of thistle. Spread a 5- to 8-inch layer of mulch over a small area that is infested with thistle. This natural method suppresses and prevents thistle regrowth after it is removed. Mulch is also beneficial as it keeps roots of other plants cool, especially during the hot summer. Burn large areas of land to eradicate thistle and seed reserves. Although this practice is environmentally harmful, it is an effective management control method for very large areas covered with thick star thistle growth. Make sure you consult your local fire department officials for permits and regulations.